One of the my major frustrations as a blogger and as a follower of economic news is the way in which misinformation and falsehoods get repeatedly passed around as they were facts. For example, one common meme that we hear a lot is that the government, especially under Obama, has engaged in a massive spending spree. The idea is pushed that government is growing out of control. This idea has been pushed heavily by Republicans and Tea Partiers. It is often combined with the conclusion that “stimulus doesn’t work”. The unfortunate part is that this idea of a government spending spree is completely untrue! Look at this graph from the FRED database at the stlouisfed.org. 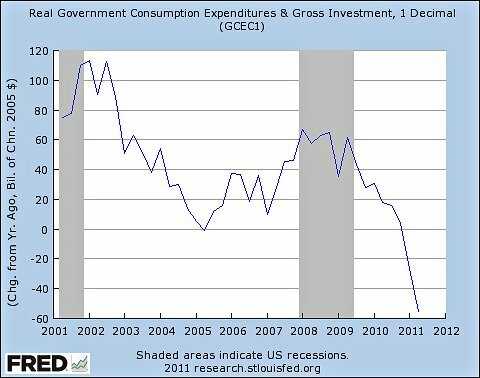 This shows the annual change in real dollars in government consumption and investment expenditures. In other words, it shows how additional spending was added each year by all layers of government in the U.S. During the recession, 2008 and 2009, governments were spending more. They were spending approximately $60 billion a year more. But notice that once the “official recession” ended in 2009 (the end of the shaded bars) governments began cutting back. By late 2010 government has cut back so much that it is now spending less each year than the last year. It’s no coincidence that this is the same exact timing when two things happened: the Republicans asserted control over the House of Representatives and began pushing to cutting spending, and the economy began to slow again and the recovery stalled. These two phenomena are related. Cutting government spending when there is high unemployment and a slow economy is a sure-fire recipe for an even slower economy and even higher unemployment. A critical thinking reader might ask “how can this be true (that government spending is lower than a year ago) if the federal government deficit is so large?”. Well there’s two explanations. The first is that the federal government deficit in the economy is largely due to the slow down in tax collections and the tax cuts that delivered little economic stimulus since they were saved, not spent. Second, government in the U.S. is more than Washington D.C. There’s as much state and local government as there is national government, particularly when it comes to spending (as opposed to transfer payments). State and local governments are cutting back and cutting back big time. The 2009 “stimulus” bill of the national government actually had a large component that involved the national government transferring money to states and locals so they wouldn’t have to cut as much. State and local governments cannot run deficits the way the national government can (they don’t have central banks). That’s over now. Now state and local governments are cutting big time – over 345,000 jobs lost at the state and local government level in just the last 12 months. Of those, the majority are teachers in education. You sound like one of them commie-hippie hybrids! Just let the top make their income and sooner or later it’ll trickle down to those poor folk who refuse to work hard. Quit giving my money away!